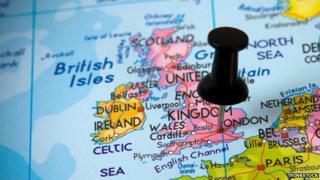 Is Great Britain really a 'small island'? A Russian official referred last week to Great Britain as "a small island to which no-one pays any attention". PM David Cameron responded by challenging anyone to name a country with a "prouder history, with a bigger heart, with a greater resilience". But he conceded that the UK was a "small group of islands". Is it? In fact Britain is "a fairly large island as far as islands go", according to Professor Godfrey Baldacchino, Canada Research Chair in Island Studies at the University of Prince Edward Island in Canada. "At the top end we usually define the very large islands as continents and from a geographical point of view there are only four of those: Eurasia-Africa, America, Antarctica and Australia. "So if we include those as mega-islands, Britain would actually be the lucky 13 - the 13th largest land mass on the planet." If you don't include those continental land masses, Britain scores higher. It's ninth, behind Greenland, New Guinea (Indonesia/Papua New Guinea), Borneo (Indonesia/Malaysia/Brunei), Madagascar, Baffin Island (Canada), Sumatra, Honshu (Japan) and Victoria Island (in the Canadian Arctic Archipelago). That puts it way ahead of some other well-known islands, Cuba for example (17th), Sri Lanka (25th), Trinidad (117th) or Long Island (148th). Russia's largest island, Sakhalin, ranks a mere 23rd. But there is another way of looking at size - population, rather than area. By this measure, Britain comes even higher up the ranking. Media captionDavid Cameron: "Yes we are a small island... a small group of islands"
If you look at the world's island states, for example, the archipelago of Great Britain with Northern Ireland (the UK) is the fourth largest, behind Indonesia, Japan and the Philippines… even if, in terms of population density, it falls a long way behind Manhattan, with its paltry area of 87 sq km but population of 1.6 million. However, these are not Great Britain's only claims to distinction within the island club. The "Great" had to be appended to "Britain" mainly to distinguish it from Brittany - also known as Britannia minor, or lesser Britain, the French peninsula that had been settled in the fifth and sixth centuries by Celtic immigrants from the British Isles. Great Britain is one of the few island civilizations that for many centuries served as the centre of a sprawling global empire. It shares that rare historic position with Tonga and Japan in the Pacific and Crete and Venice in the Mediterranean (Venice being a network of 118 small islands). Britain is also "one of the few islands of significant size that officially calls itself 'great'", points out Professor Baldacchino. Most islands that claim this distinction are actually very small, and are only called "great" to distinguish them from even smaller nearby islands with the same name. There is the 0.07 sq km Great Captain Island for example, lying off the coast of Greenwich in Connecticut, US. The isle is the largest of a three-island group that also includes Little Captain and Wee Captain. Or there are The Misery Islands, a nature reserve in Massachusetts consisting of the 0.34 sq km Great Misery and 0.016 sq km Little Misery. The islands were named by a shipbuilder, Robert Moulton, who was stranded there during a winter storm in the 1620s. And we have The Great Cranberry Island, renowned for its pea-size berries that grow profusely in autumn, or The Great Diamond Island with a year-round population of 77, as of the 2000 census. Both in Maine, US. All are smaller than Britain. "In the realm of islands, there is nothing greater than Great Britain," says the professor, who was born on the island of Malta and teaches in Canada, a country that boasts three of the world's 10 largest islands - Baffin, Ellesmere and Victoria. "Now, I'm not sure whether that's a gesture of pomposity or presumptuousness, but it could nearly be a factual indication of Britain's relevance on the world's stage."